I like to eat. I’ve always liked eating. There’s something about food that really does it for me. I really like a peanut butter and jelly sandwich, as well as chips, among others. I also like walking. There’s a good time to be had one footing it in front of the other. In addition, I like to time travel. I do it on the average of three times a week. Sometimes more. It’s exciting to get out of the drab this moment, arriving in the new one. Hang on, I’m going to do it now and I’ll be right back. I’m back. What a great time it was. I went to visit President James Garfield at the White House. It was July 2nd, 1881. I informed him I was from the future, and that he was going to be shot later that morning. If said if he stayed in, he was certain to be okay. President Garfield didn’t believe me, nor that I was a time traveler. I showed him a book called Brockner’s History of the American Presidents, 1789 to 2018. I opened to chapter twenty which was named after him. President Garfield read the chapter. He looked a little worried. But then said that any book can be written about the future. But that doesn’t make what it says true. I said the difference was this book was written in the future. He said that he didn’t have time for such outlandish silliness and left for the train station. There were screams. Garfield turned around and gasped as a man approached in his direction with a gun. The man said to me, “Excuse me, but what are you reading from?” I held up the book for him to see. He read the passage with a raised eyebrow. He said, “That’s astounding. This mentions me. How is it possible Brockner’s could know?” By then police had arrived and took the man into custody. 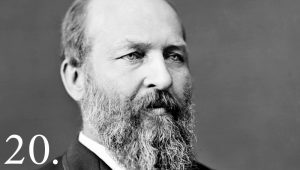 President Garfield sighed and said, “I am sorry to have disbelieved you. The country is in your debt.” I loved hearing those words. I often don’t feel I make a difference. Time travel filled that hole.